In December 2015, nearly every country, including all of the world’s biggest polluters, came together in Paris and agreed to limit carbon emissions. The Paris Agreement was designed to keep the planet from warming by more than 1.5 degrees Celsius above preindustrial levels. It was a cornerstone of President Barack Obama’s environmental legacy. Now President Donald Trump is withdrawing the US from the accord. Here’s a quick primer on the Paris Agreement. What did the US agree to? The Paris Agreement laid out a framework for countries to adopt clean energy and phase out fossil fuels. Each country submitted a climate-action plan laying out how it would achieve these goals. The US’s plan, which the Obama administration submitted in March 2015, set the goal of reducing greenhouse gas emissions by 26% to 28% by 2025. The baseline level this reduction is measured against is 2005, when the US emitted 6,132 million metric tons of carbon dioxide. Most greenhouse gases come from burning fossil fuels like oil, coal, and natural gas, but they also come from using fertilisers, raising livestock, and maintaining landfills. Greenhouse gases include carbon dioxide, methane, and hydrofluorocarbons. Obama signed an executive order confirming the US’s adoption of the agreement, but he didn’t submit it to Congress for approval. That’s how Trump is able to “cancel” the US’s commitment to the accord. The Obama administration also enacted carbon-cutting measures to put the country on track to meet the goals set in Paris and position the US as a leader in fighting climate change. Under Obama, the US started to reduce its emissions, both because of the rise in affordable renewable energy and the abundance of natural gas due to fracking. Congress never ratified the Kyoto Protocol, an extension of an international climate agreement established in 1992, essentially making it moot. Some experts worry the same thing could happen to the Paris Agreement. 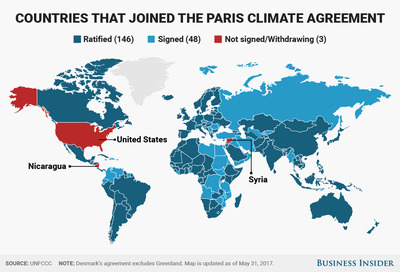 One hundred ninety-five countries agreed to the Paris accord, and only Syria and Nicaragua didn’t sign it. The US is the world’s second-largest carbon emitter, after China. Together, the countries accounted for 45% of the world’s carbon dioxide emissions in 2014. This was the first climate accord that both superpowers agreed to, which legal experts heralded as the best sign of its long-term worldwide success. Two-thirds of Americans said they supported signing onto an agreement that would legally bind the US and the rest of the world to cut carbon emissions, according to a New York Times/CBS News poll released before talks began in Paris. A 2016 Pew poll found that 48% of Americans believed that the Earth was warming because of human activity, and 49% believed an international agreement to limit carbon emissions could make a big difference in addressing climate change. But the concern is growing. A March 2017 Gallup survey found that 45% of Americans worried “a great deal” about global warming and 68% believed humans were causing it. Major companies support the Paris Agreement. Apple, BP, Google, Microsoft, Shell, and several others sent Trump a letter in April encouraging him to keep the US in the pact because it strengthened their competitiveness, created jobs, and reduced business risk. Climate experts say that an increase of more than 2 degrees Celsius in the planet’s temperature could bring about irreversible consequences, including a rise in sea level, superstorms, and crippling heat waves. It was estimated in 2011 that the average global surface temperature was increasing at a rate of more than 0.1 degree Celsius a decade.